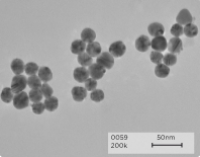 Nanoparticles, particles which are smaller than 100nm, benefit a wide range of applications including the synthesis of silicon based fluorescent nanoparticles (quantum dots) to label biomolecules for diagnostic assays, polymeric nanoparticles for intracellular analysis and drug delivery, and catalytic nanoparticles for specific chemistries or purification by absorbing pollutants. Microfluidics technology is ideal for nanoparticle synthesis. Reducing reagent consumption, it allows tighter particle size distributions, improved control over reaction times and temperatures, as well as better mixing efficiency. In collaboration with Newcastle University, Dolomite explored the application of microfluidics for the synthesis of nanoparticles for use in biochemistry. Dolomite designed and manufactured a custom glass microfluidic chip with a complex channel geometry featuring multiple reaction chambers. The chip was manufactured using Dolomite’s world leading production processes such as lithographic patterning, isotropic etching of glass substrates and the accurate alignment and thermal bonding of glass substrates. Dolomite also developed a versatile chip holder to interface the custom chip with the rest of the microfluidic system.